In a previous article, I looked at how to check a battery and get some good information on the state of your Austin’s charging system. This article follows on from that, looking at the powerhouse necessary to actually get some charge. The purpose of the dynamo is to generate electricity from the engine. How it works is simple enough, but there are some oddities. In it's simplest form, a dynamo would be a rotating magnet inside a coil of wire. As the magnetic field rotates, the lines of magnetic flux, (remember playing with iron filings as a child?) cut the wires and electromagnetic force is induced into the windings. Here come our two complications. Firstly, if you pull apart a dynamo, you won't find a big red horseshoe with one end labelled North! The magnet is actually an electromagnet formed by a set of coils inside the housing. These are the field coils, so called because they are used to create the stationary magnetic field. The amount of magnetic field is determined by the strength of the electric current flowing through them, of which more later. In the middle of the dynamo, on the shaft, is a fat sausage of iron segments wound with coils of wire. Each of these coils is connected to copper segments towards one end of the shaft. So, instead of a rotating magnet in a coil, we have coils of wire rotating inside an electromagnet. The copper segments are very important. The coil of wire, as it rotates, would naturally produce an alternating current (being positive when near the top field coil and negative when near the bottom coil). This is no good, we need direct current. So, the copper segments allow the dynamo to switch in and out coils as they rotate, to ensure that current always flows the same way. This is the commutator, which makes contact with the carbon brushes in order to make a circuit as they rotate. 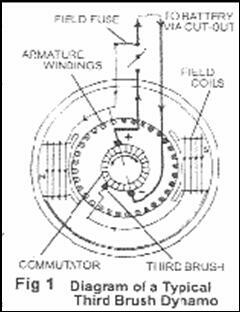 The commutator is very important to the operation of the dynamo. Firstly, it must be clean. As the carbon brushes touch it, good contact is essential. Any dirty places will cause a high resistance, which wastes the energy and can result in overheating. Secondly, adjacent commutator segments must be insulated from each other. Failure to do this will short out all that useful power, and fry up the dynamo. Thirdly they must be smooth. The segments rub against the carbon brushes to make contact. If they are rough, the brushes will wear down extremely quickly. So, commutator maintenance is important. If yours looks nice and smooth, with clean copper showing, then all well and good. If it is a bit grubby, treat it to a wash with some thinners on a small paintbrush. If it's rough, then it will need turning smooth. Basically, a skim with a lathe is needed here, followed by carefully cutting between the segments with a broken junior hacksaw blade to ensure that they are separate. Whilst you're in there, treat it to some new bearings. Back to the brushes. As you'll see, there are actually three of them. The two big brushes are for the rotor, or armature, and these carry the amps for charging up the battery. There is also a third brush, connected such that it can be moved around the armature. This is the field brush. Remember I said that the field can be adjusted to give different magnetic strengths? Well, this moveable brush is one of the adjustments. What happens is that the closer the third brush is moved to the dynamo negative brush, the more armature coils will be tapped into for the field current and vice versa, so it is moved in the direction of rotation to increase the current and against the direction of rotation to decrease it. The other adjustment occurs outside the dynamo. Actually, you do it using the summer / winter setting on the light switch. What happens here is that the power of the dynamo is switched between two settings, (summer / winter) by changing the current through the field coil. In the summer setting, it is assumed that you won't be needing lights very much, so the charging is set up to account for ignition, brake lights and trafficators. In the winter setting, the charging current is set higher, to account for the use of lights. By the way, you'll often see me driving with sidelights on in full daylight: the reason for this is that my 'Seven' tends to charge a bit too hard, so I bleed off some of this extra power in the sidelights rather than fry the battery. If you're not getting the right charging voltage, we can quickly decide if the dynamo is the culprit. Get out your test meter again. It has a resistance range of 0 to 200 Ohms, (shown as Ω). Now, all meters have some resistance in their test leads, so we need to allow for that in every measurement. Touch the two probes together and allow the reading to settle. This value, (which should be something like 0.5) needs to be subtracted from every measurement we take. With the engine off, and preferably with the battery isolated, place one probe on the case of the dynamo, (digging through any paint or grime to get a good earth). Place the other on each dynamo terminal in turn. By the way, if you have a 12V mod which has included a wire jumper across the terminals, (one way of getting more field to cope with 12V charging), this needs to be removed before you do this test. The resistance of the armature (i.e. between the case and the D terminal) should be about 0.3 Ohms, (remembering to subtract the lead resistance you measured a minute ago). The resistance of the field coil (i.e. between the case and the F terminal) is higher, at about 0.9 Ohms. Note that these figures won't be exact, as it needs specialist equipment to measure such small resistances accurately. Nevertheless, this indicates that both windings are connected and neither is shorted to the case. If these figures are very different, then what does that tell us? For starters, if the meter readout just shows a 1 somewhere over the left hand side, this means that there is an open circuit. In this instance, either the brush has become disconnected, is worn out or is stuck. The worst case is that the winding itself may have become open circuit. Whichever, the dynamo is going to come out for refurbishment. For advice on this, see the article - Servicing and Repairing Dynamos. If the resistance is much less than I've suggested, then either there is a wiring short or the winding's insulation have failed. Disconnect each terminal in turn, (remembering which is which because it matters!) and try again. Now would be a good time to check that the wiring is still all connected and that the field fuse hasn't blown. Set the meter to it's most sensitive range, (which on the Maplin one is 200 millivolts full range). Connect between the case of the dynamo and each terminal in turn. With the ignition off, you should see precisely 000 displayed. With the ignition on but the engine stationary, due to the tiny current that flows though the ignition warning light there should be some small reading. On Archie, I get 30 millivolts on the field coil and about 45 millivolts on the D terminal. The actual values don't matter - what we know is that they are connected. Note for the 12 volters - if you have a regulator that doesn't have conventional relay type operation, such as a wire resistance type or a solid state type, this may be quite a lot different. You should still get some feed through the ignition warning light but may get more through the regulator circuit. This tells us something else that is quite important: the miniscule current that gets through the ignition warning light is enough to get the dynamo's magnetic field started. Yes it is small, but there has to be something. So, if you don't have a warning light, it's time to check that bulb! This article, written by Geoff Hardman, originally appeared in CA7C Seven Focus in Sep 2005 pp20-22.